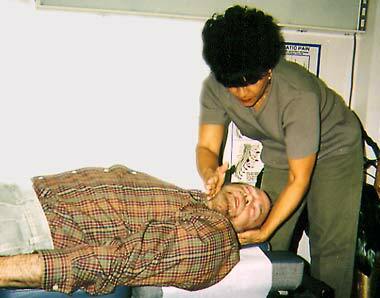 People’s Chiropractic Clinic uses a holistic approach to health. The body and mind are brought together as the first step to better health, and with the doctor’s guidance, all patients are encouraged to take an active part in the maintenance of their health and in the treatment of their illnesses. Chiropractic adjustments, physical therapy and nutritional modification and supplementation are individually tailored to fit the patient’s need and because attitude is an important factor in the healing process of the body, the mind is also addressed. Healing is achieved expediently. The following cases illustrate the care given to three individuals and the positive results brought about by the holistic approach to their treatment plan. He was age 4 when his mother brought him to my clinic. He had suffered from allergies / asthma since age 2 1/2, had tubes put in both of his ears and had continuous green mucus discharge from his nose since that age. His mother told me that her child was about to go into surgery again to have another set of tubes put in his ears and that she did not want that. She told me that her child continued to have fluid in his ears and that the doctors were very concerned because her child was losing his hearing as a result. Because there was not improvement with the first operation, she was worried that the second one would not help. She was also upset about having to give her child steroids and antibiotics all the time and decided to seek alternative care instead. Nutritional supplementation and dietary changes helped the child rid of the chronic green mucus discharge. Chiropractic adjustments freed the sinus, bronchial and ear pathways from nerve interference, returning proper function to these parts. Two weeks after starting treatments, a hearing test was performed, and it was found that the child no longer needed the operation! The chronic green mucus discharge had now turned clear and with a few more treatments it totally subsided. The child’s parents are very grateful and have decided to continue the holistic approach because it works. Being of sound mind, I (name omitted) wish to leave my daughter and son all I own, to be distributed equally.” This was my patient’s Last Will and Testament which she had written a few days before she came to see me at her daughter’s request. She had severe back pain. In addition, every August, ever since she could remember, she would develop Asthma for 1 month, followed by three months of Bronchitis, followed by 1 month of Pneumonia at which time she would end up in the hospital. To my patient, “Death” seemed more attractive. This was a 54-year-old woman who had not worked for 2 years because of severe joint pain, extreme catarrhal (mucus) condition, and obesity. It was mid-July when she first came to see me. Her treatments consisted of chiropractic adjustments, physical therapy and nutritional modification and supplementation. The chiropractic adjustments and physical therapy helped to mobilize her joints, ridded the spine of toxic fluids which brought the pain, increased circulation to the joints, and remodeled the tissues, in this way diminishing reoccurrence. The nutritional modification and supplementation ridded the body from her severe catarrhal condition. That year, for the first time in years, she was able to enjoy a fall and winter free of Asthma, Bronchitis, and Pneumonia. When August came, she only developed the sniffles, which soon waned away as she continued her individualized treatments. She now enjoys a body free from aches and pains, lost 45 lb. in 4 months and she started her own business baby-sitting children at her home. Oh, her eyesight got better too. This was a bonus, completely unexpected. Do you know that 8 out of every 10 people in the United States suffer from back pain? The U.S. Agency for Health Care Policy and Research reviewed 3,900 studies on acute low back pain. Bed rest was rejected, as well as injections into the back, and all oral prescription drugs such as antidepressants or steroids and surgery (except in rare cases). Yet, they found that spinal manipulation, which is usually performed by a Chiropractor, can be helpful for patients with acute low back problems1. Chronic low back pain is also helped by Chiropractic, as reported in the study made and published in the medical journal, Spine. This patient was a 51 year old male who was involved in an almost fatal car accident several years ago. He broke one ankle and a few ribs and was left somewhat facially disfigured. He hurt all over, could hardly talk or barely open his mouth. He ground his teeth while sleeping and would wake up with a headache every morning which lasted all day long and sometimes it would turn into a migraine. He had trouble walking and would fall a lot, he was constantly dizzy and his back and neck always hurt. He was told by several physicians that nothing else can be done for him, but prescribe pain killers, which after taking them for a while their effectiveness for killing pain waned away. A comprehensive examination, X-Rays, laboratory work and a detailed health appraisal evaluation revealed a severe deviation of the Temporal Mandibular Joint (TMJ) which contribute to the daily headaches, facial disfigurement, and inability to talk or fully open his mouth. The neck and back showed severe postural alterations with neurological consequences impeding his ability to move freely and without pain. Chiropractic adjustments and nutritional supplementation helped rid the body of inflammatory fluids contributing to pain, in turn allowing nutrients to come in and fortify the joints which promoted healing. Physical therapy broke up the scar tissues, decreased swelling, increased circulation to the joints, and remodelled the tissues in this way avoiding reoccurence. Orthotics were also implemented to help control pain, to protect the spine during vigorous activity, to provide greater strength and improve his ability to move without fear of falling. After a few months of treatments, the patient is now able to speak without difficulty. The headaches and grinding of the teeth have subsided. Improvement is noted in his ability to move about and maintain a good equilibrium and he is enjoying being freed from chronic pain. Neck pain, headaches, back pain, TMJ dysfunction, and weakness are basic symptoms, among several others, found in Whiplash injuries. A blow to the back, car accidents, and on the job accidents can leave you with a whiplash injury. Sometimes symptoms can be felt immediately, but often symptoms are delayed for days, months or years2. The most common symptom of whiplash affecting 62% to 92% of those injured, is neck pain3. Often this is the result of tightened muscles reacting to either muscle tears or excessive movement of joints from ligament damage. The muscles tighten to splint up and support the head, limiting the excessive movement. An estimated 66% to 70% of those suffering from whiplash complain of headaches4. Muscle tears can be felt as burning pain, prickling or tingling, and if there is disc damage, sharp pain with certain movements may be felt. Whiplash injury left uncared for, can cause more serious problems months, even years later, such as in the case above.